Civil rights activist Rev. C.T. 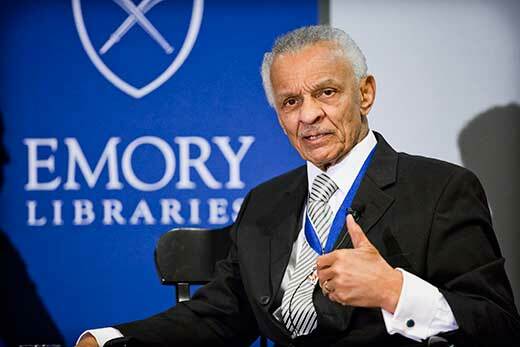 Vivian, pictured here at a 2013 Emory Libraries speaking engagement, is one of many African American leaders in The HistoryMakers Digital Archive with an Emory University connection. Vivian, who placed his papers with the Rose Library in 2014, was an integral member of SCLC, a civil rights organization which also placed its papers with the Rose Library. Image: Emory Photo/Video. The HistoryMakers Digital Archive is one of Emory Libraries’ newest licensed databases, offering access to hundreds of full-length oral-history video interviews with African Americans in a variety of fields including business, medicine, the arts, education, entertainment, religion, civic leadership and activism, politics, media, music, the military, sports and more. The licensed database is open to current Emory students, faculty and staff. There are nearly 1,200 interviewees listed in the index, with multiple interview clips for each person. The database includes such history makers as civil rights activists C.T. Vivian, Joseph and Evelyn Lowery, and U.S. Rep. John Lewis; late Emory professor Richard A. Long; Atlanta Journal-Constitution reporter Ernie Suggs; and Ebony magazine editor Lerone Bennett and artist Amalia Amaki, both Rose Library supporters. “This will be a fabulous resource for my students,” says Carol Anderson, Samuel Candler Dobbs Professor and chair of Emory's African American studies department, who says she came across political leaders such as John Conyers, a founding member of the Congressional Black Caucus. The digital archive is an enhanced product from The HistoryMakers, an organization that records and preserves the nation’s largest African American oral history video collection and shares it on www.thehistorymakers.com. With the database subscription, Emory users have access to more interviewees and more interview clips, Dudley says. The interviews, averaging more than three hours, are broken up into short story clips and tagged with the subject’s name and the general topic or theme, such as discrimination/ experience with racism, leadership, turning points, overcoming odds, and others, making the database easier to use for both students and researchers. The HistoryMakers Digital Archive can be accessed via the search box on the Emory Libraries homepage or directly from The HistoryMakers with an active Emory University login. In related news, Emory is one of three universities, along with Yale and Harvard, to offer a visiting archival fellowship for African American collections. The position is in collaboration with The HistoryMakers’ initiative to provide training to African American archivists and archivists interested in working with African American collections. Emory’s two-year visiting archivist for African American collections is slated to begin on Aug. 1. View more details about the position. For more information about this database or to schedule a demonstration for a class, contact Erica Bruchko, African American Studies and U.S. history librarian.